New collection of commercial magnets - in many colors! New articles made for inventory labeling! During closing period we will have an emergency tel.nr: +46 707 360390. We wish you a great Easter holiday ! Welcome to use our own, unique, the one and only... magnet calculator (beta)! Create the magnets you need and let us manufactur it for you. We stock a wide range of permanent magnets. Cylinders, blocks, rings, segments and many other forms, available in various magnetic material and thousands of different dimensions. We develop, design and build magnetsystem with the highest technical skills. We offer fast and unique customer solutions and has one of the widest range of magnets in Europe with approx 2000 items in stock. Click here for info about when we close for summer. We appreciate if you would fill in the customer survey below! Our latest product-commercial on the fantastic Cutlery Picker! Check out our PDF catalogue. If you can't find what you are looking for, don't worry. Contact us and we will make it for you! Hyab Magneter in the news! 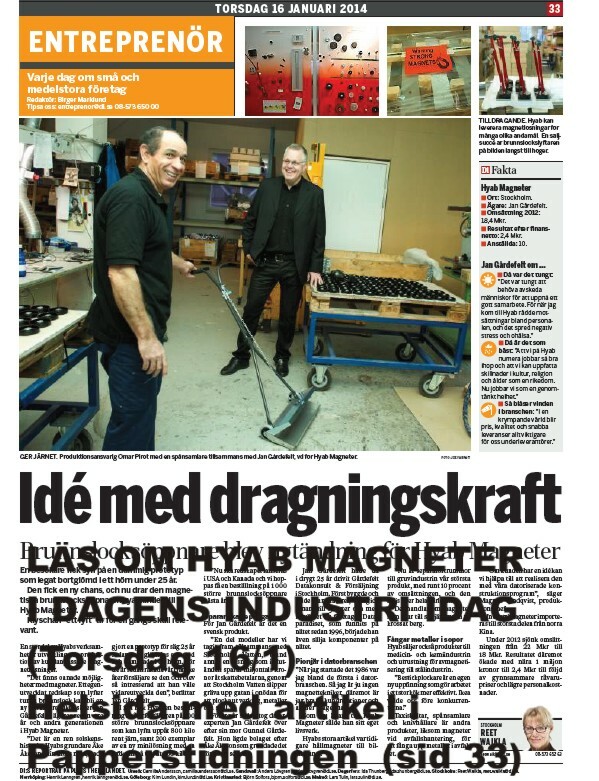 Full page about Hyab Magneter AB in Dagens Industri, 16 January 2014 (Papper newsletter) Entrepenör / "Idé med dragningskraft"